Fed Submit (Civil) is used by civilian companies and institutions such as airports, banks, and school districts, to streamline background checks and electronic submissions to the FBI or OPM. 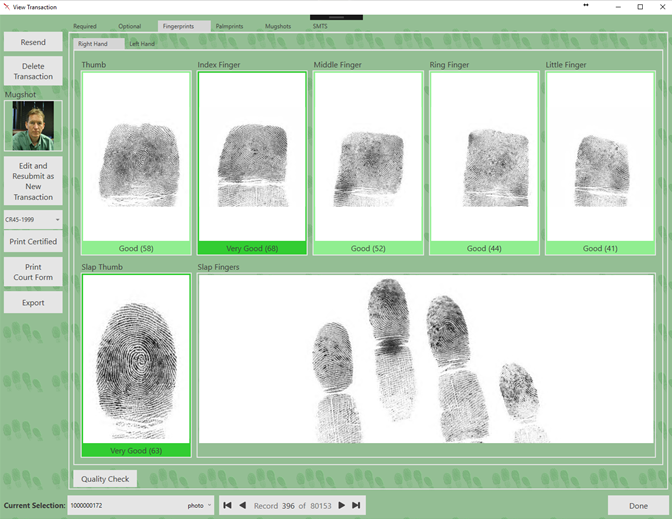 Digital fingerprinting dramatically decreases response time from sluggish, traditional mail-in methods, allowing total control of the printing process from start to finish. Fed Submit (Civil) is highly adaptable, scalable, and cost effective to make workforce management work for you. • In-house applicant systems allow for significantly faster response times and flexible scheduling for applicants. • Mentalix solutions can be scaled up or down to accommodate any operation of any size. • Systems integrate with cost effective off-the-shelf hardware. • Eliminates the lengthy and messy process of ink capture and mail-in submissions. • Intuitive interface is easy to learn and even easier to use. • Designed for background checks including standard NIST fields, no specialization required. • Streamlines transaction administration, submission, and tracking, all from one convenient system. • Local database allows full text-based searches. • Regular software upgrades and a dedicated in-house support staff based in Dallas, Texas. • Electronic submissions accepted by OPM, LexisNexis, AAAE, DPS, etc. For desktop PC: 20-inch or larger LCD flat-panel display. Monitor must be XGA (Extended Graphics Array) capable or better. If your destination agency is LexisNexis or OPM, you will only need a modem or VPN Internet connection. VPN is highly recommended. To receive the full benefits of Mentalix maintenance, you will be required to provide remote access to your system. This will allow Mentalix support personnel, while under your supervision, to diagnose problems on your system. To enable remote access, you should have the LogMeIn client installed.